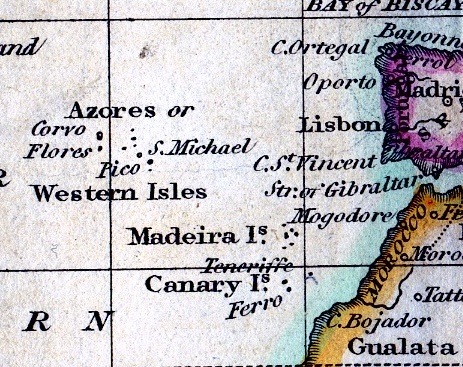 The Azores, called also the Western Islands, have been by different geographers deemed parts of America, Africa and Europe, being situated almost in a central line between them; but as they lie near some of the islands in the northern Atlantic we deem this the most proper place for their insertion. These islands are situated in the latitude of between 37 and 40 degrees north, about five hundred and forty geographical mils to the north-west of Madeira. They are nine in number, and are named Santa Maria,St Michael, Tercera, St George, Graciosa, Fayal, Pico, Flores and Corvo. They were discovered in the middle of the fifteenth century, by Joshua Vander berg, a merchant of Bruges in Flanders, who on a voyage to Lisbon was, by stress of weather driven to these islands which he found destitute of inhabitants and called them the Flemish Islands. On his arrival in Lisbon he boasted of his discovery, on which the Portuguese set sail immediately and took possession of them, which they still retain. They were called, in general, the Azores, from the great number of hawks and falcons found among them. All these islands enjoy a very clear and serene sky with a salubrious air, but are exposed to violent earthquakes, from which they have frequently suffered; and also by inundations of the surrounding waves. They are, however extremely fertile, in corn, wine and a variety of fruits, also cattle, fowl and fish. It is said that no poisonous or noxious animal breeds on the Azores and if carried thither, they will expire in a few hours. St Michael which is the largest, being near one hundred miles in circumference, and containing 50,000 inhabitants was twice invaded and plundered by the English in the reign of Queen Elizabeth. Tercera is the most important of these islands, on account of its harbour, which is spacious and has good anchorage, but it is exposed to the south-east winds. Its capital town, Angra, contains a cathedral and five churches and is the residence of the governor of these islands, as well as of the bishop. Pico or, The Peak, has a mountain of remarkable height, by some reported to equal that of Tenerife and which might well be assumed as the first meridien of longitude instead of the various and confused distinctions which have been adopted. The rest of these islands do not contain anything remarkable, nor do they vary form those described in any of their productions. But it must be observed that all of them have at least one harbour capable of receiving various kinds of vessels. Use the "Show me" link to locate Western Islands on the map. You may need to scroll down to see Western Islands highlighted. "Ah! those were pleasant days when I had the Laconia! How fast I made money in her! A friend of mine and I had such a lovely cruise together off the Western Islands. Poor Harville, sister! You know how much he wanted money: worse than myself. He had a wife. Excellent fellow! I shall never forget his happiness. He felt it all so much for her sake. I wished for him again the next summer, when I had still the same luck in the Mediterranean."